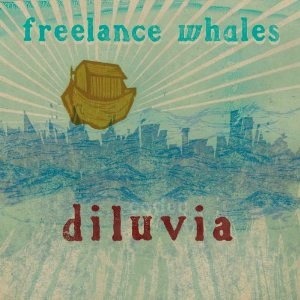 Our organic sounding Earth-loving Freelance Whales create fantastical sounds and stories on their sophomore record, Diluvia. Weathervanes gave us the tale of a child mesmerized by a young female ghost. Diluvia presents us with scenes of space exploration, survival, dreams, and otherworldly sounds. “Follow Through” has a twinge of ’80s sound incorporating Freelance Whales’ trademark keys, synthesizers, and blended voices. The following tune, “Spitting Image,” displays an even more futuristic vibe with increased use of those good ol’ synthesizers and echoing words, similar to Weathervane’s “Generator ^ First Floor.” “DNA Bank,” the longest track on the album sways and soars for almost eight minutes. The band sings of our species, angels, and our fathers’ hopes. The song swirls around our spirits like a spinning double helix. Evolving and emerging more powerful and vibrant with every chorus, they sing, “And we will never find ourselves alone.” With Diluvia by our sides, we too will always have company when we fly off and explore the infinite abyss.